I posted this photo on WOW! 's Facebook wall the other day, and we received more responses than usual! I know it hit a nerve with some of you. Since others might not have seen it, I thought I would take the opportunity on my blog post day to tell you why I chose to put it on a Facebook page about writing. It's not really about writing. . .or is it? Of course, "destination addiction" is mostly about our personal lives--having the attitude of. . . I'll be happy if I can just buy the right house, if I can just get a fiance, if I can just save money to buy that new car, and so on. 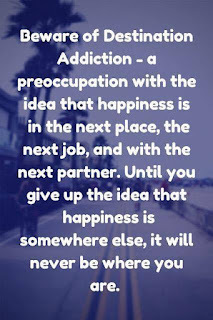 Most of us realize that it is actually not the destination that makes us happy, once we have achieved something like a new house and still felt dissatisfied. SO what does make us happy? It is different for every individual, but it is often the process, the work, the people you are spending time with, the adventures you are having on the way to your destination. I think this pertains to writers more than almost any other profession (or maybe creative types in general, I should say). Writers are always thinking: if I could just get published or if I could just sell 1000 copies or if I could just win this writing contest or if I could just get a contract with an advance--then I would be happy or successful or both. But why do you write? Sure we all dream of fame--okay most of us. But that is not why we started writing. If we want fame or fortune, there are much easier ways to go about getting both than pouring our hearts into a manuscript that someone might want to read and pay us for. I think we have to be careful of destination addiction with our writing careers. I've had it. I got published, and I was very happy for a minute, but that's when the real work began--that's when I had to market myself and worry about writing too. We will soon be making goals for 2016 or maybe you already have. Just remember--goals are great and can help you stay focused, but you also need to enjoy the steps you take while reaching the goal. 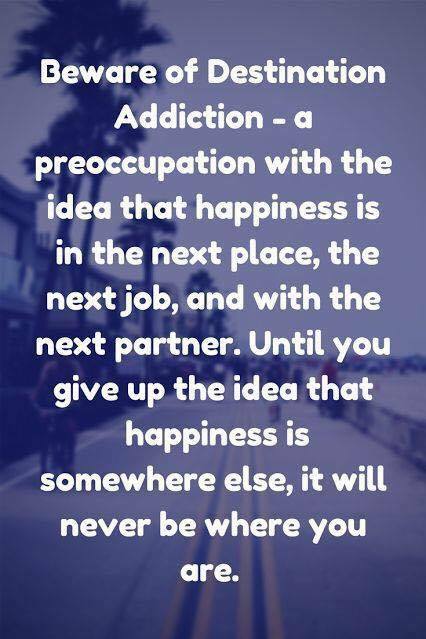 Don't let destination addiction steal the joy you can feel right now during the process. Margo L. Dill is a writing coach, editor, and children's author in St. Louis, MO. She teaches online classes for WOW! Women On Writing on novel writing. To find out more, please visit http://www.margodill.com . Margo--I think it was Harry Chapin that wrote (and sang) that "it's the goin'--not the gettin' there... that's good." This post really hit home. I need to savor the process and enjoy it--and stop worrying about some elusive goal/destination/source of happiness... 'cause right now, I'm happy. If I can just sell to a new market. . . I'm sure we've all said something like that a time or 12. Thank you for reminding us to enjoy the journey! Proper Spelling Is Arbitrary...Or Is It?